A broken fossil turtle bone discovered by an amateur paleontologist in 2012 turned out to be the missing half of a bone first described in 1849. The surprising puzzle discovery has led paleontologists from the Academy of Natural Sciences of Drexel University and the New Jersey State Museum to revise conventional wisdom of how long fossils can survive exposed to surface conditions. 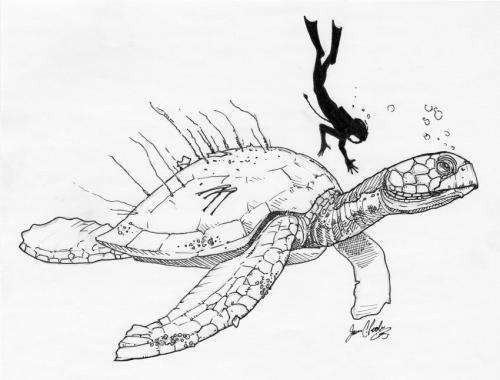 It also provides insight into one of the largest turtle species ever known. "As soon as those two halves came together, like puzzle pieces, you knew it," said Ted Daeschler, PhD, associate curator of vertebrate zoology and vice president for collections at the Academy of Natural Sciences of Drexel University. That surprising puzzle assembly occurred in the fall of 2012, when Jason Schein, assistant curator of natural history at the New Jersey State Museum, visited the Academy's research collections to better identify and describe a recently-unearthed fossil. The discovery linked scientists from both museums to their predecessors from the 19th century, while setting the stage to advance science today. The partial fossil bone that Schein had brought to the Academy was a recent discovery by amateur paleontologist Gregory Harpel. Harpel thought the bone seemed strange and out of place when he noticed it on a grassy embankment, a bit upstream from his usual fossil-hunting haunt at a brook in Monmouth County, N.J. Visiting the brook to search for fossil shark teeth is a weekend hobby for Harpel, an analytical chemist from Oreland, Pa. "I picked it up and thought it was a rock at first – it was heavy," Harpel said. Schein and David Parris, the museum's curator of natural history, immediately recognized the fossil as a humerus – the large upper arm bone – from a turtle, but its shaft was broken so that only the distal end, or end nearest to the elbow, remained. "I didn't think there was any chance in the world they would actually fit," Schein said. That's because the Academy's piece of the puzzle was much too old, according to the conventional wisdom of paleontology. Paleontologists expect that fossils found in exposed strata of rock will break down from exposure to the elements if they aren't collected and preserved, at least within a few years— decades at the most. There was no reason to think a lost half of the same old bone would survive, intact and exposed, in a New Jersey streambed from at least the time of the old bone's first scientific description in 1849, until Harpel found it in 2012. The Academy's older bone was also without a match of any kind, making a perfect match seem even more farfetched: It was originally named and described by famed 19th-century naturalist Louis Agassiz as the first, or type specimen, of its genus and species, Atlantochelys mortoni. In the intervening years, it remained the only known fossil specimen from that genus and species. 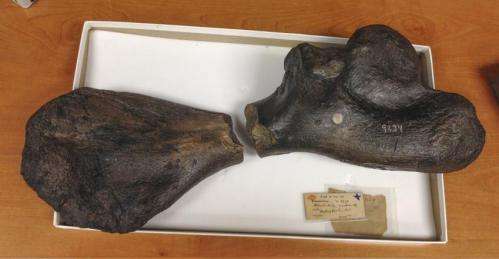 It remained so until that fateful day when Schein carried the "new" New Jersey fossil to the Academy in Philadelphia, connecting the two halves. The perfect fit between the fossils left little space for doubt. Stunned by the implications, Schein and Academy paleontology staffers Jason Poole and Ned Gilmore, who had assembled the puzzle together, called Daeschler into the room. "Sure enough, you have two halves of the same bone, the same individual of this giant sea turtle," said Daeschler. "One half was collected at least 162 years before the other half." Now, the scientists are revising their conventional wisdom to say that, sometimes, exposed fossils can survive longer than previously thought. They report their remarkable discovery in the forthcoming 2014 issue of the Proceedings of the Academy of Natural Sciences of Philadelphia. The find is also featured in the April 2014 issue of National Geographic magazine, on newsstands now. "The astounding confluence of events that had to have happened for this to be true is just unbelievable, and probably completely unprecedented in paleontology," said Schein. The fully assembled A. mortoni humerus now gives the scientists more information about the massive sea turtle it came from as well. With a complete limb, they have calculated the animal's overall size – about 10 feet from tip to tail, making it one of the largest sea turtles ever known. The species may have resembled modern loggerhead turtles, but was much larger than any sea turtle species alive today. Heavy rains yield big dinosaur fossil find in Md.